For this Risotto recipe I decided to use the flavors of the season. Pumpkin. Pecans. Nutmeg, cinnamon & cloves. A creamy ode to Thanksgiving! And just like at Thanksgiving, any leftovers warm up delicious. Comfort food at its peak! Place pecans in a medium skillet over medium heat and toss until nicely toasted. Remove from heat and set aside. When cooled, reserve a few whole pieces for garnish and chop remaining pecan into smaller bits. In another skillet, sauté the onions and garlic in butter and olive oil for 8 minutes. Add the arborio rice and season with the salt & allspice. Sauté a few minutes more. Add the pumpkin and the white wine. Stir to combine. Add chicken stock, one ladle at a time (about 1/4 cup each time), stirring between each addition of chicken stock – allowing the stock to absorb slowly into the rice; this can take 20-30 minutes. When the arborio rice is tender and all of the stock has been added, sprinkle in the pecan pieces and Parmesan Romano cheese. Stir well to combine. 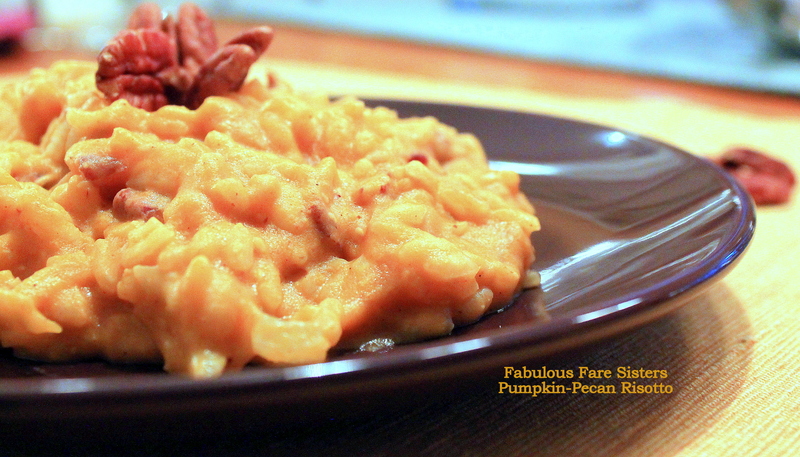 Serve Pumpkin-Pecan Risotto on plates and garnish with reserved pecans. Sprinkle with additional cheese if desired. Ooh, I want to dive right in to this. Yum! Sounds perfect right now! (for breakfast, lol). Mmmm delicious delicious!! We love pumpkin risotto :). And pecan is a great addendum. Sounds perfect :). Ahah well I’m sure he’ll be crazy about this kind of combination in a few years time…! Linda, what a fabulous recipe! I am going to make this soon. Love the fall colors and flavors! I love the flavors of this season too! Linda – this looks sinfully delicious! WOW! Incredible recipe. I will have to try this immediately – lol! Meeee tooo! And love the pumpkin spin on this classic! Looks delicious! I make something very similar. Love the fall flavors!! !